Thank you QVC for sponsoring this post. While this was a sponsored opportunity from QVC, all content and opinions expressed here are my own. With back to school season in full swing, we’ve been focusing a lot on getting our big kids ready for their return to the halls of academia. It’s understandable, they need a lot of supplies and they’re on a strict deadline. Now that most of the kids are back, though, it’s time to focus on the little ones. We all know that a strong early childhood education sets a foundation for all the years to come, after all. Here’s the good news: with a little time and effort, you can give your child a fantastic foundation at home. Even if you send your little one to preschool, like I did, having the right tools can go a long way towards reinforcing what they learn there. I’m sharing a few of my favorite items from QVC for creating a preschool learning center at home. These items work perfectly in your child’s room, or you can set up a whole separate “school” room if you have the space. Get More of What You Love with the QCard! 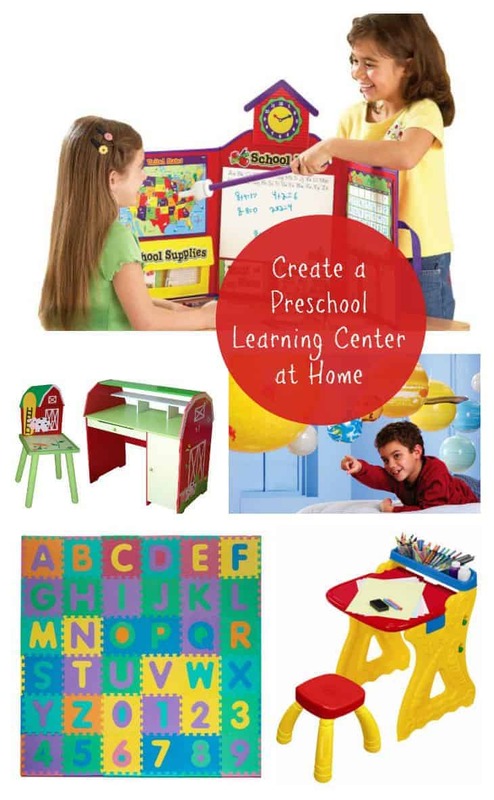 What items would you add to your preschool learning center? Tell me in the comments! A fun desk is the cornerstone of a great preschool learning center. With a great workspace, you can take your child’s learning journey just about anywhere. 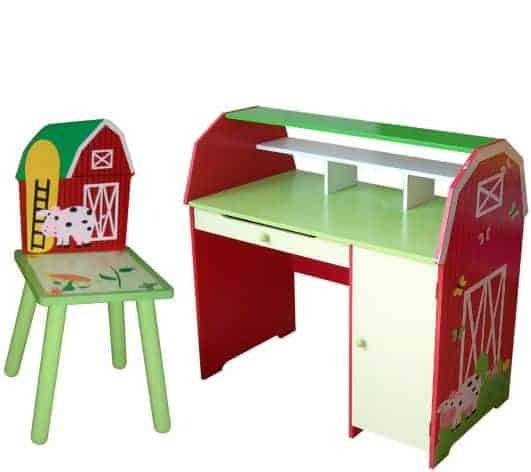 I love the farm desk with matching chair because it’s gender-neutral, spacious and oh-so fun! Plus, it’s about the size (width and height-wise) of a small bookshelf, so it doesn’t take up too much space in your child’s room. 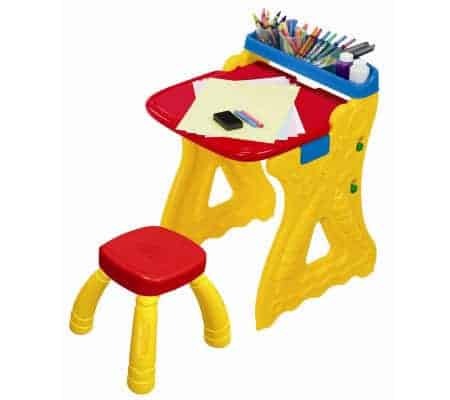 The Crayola Fold N Go Art Studio is ideal if a bigger desk is out of the question, or if you want something you can put in another room of the house. The primary colors are bright and fun for preschoolers and the workspace is generous without overwhelming small arms. It folds up so you can store it out of the way when your child is done creating. The sections for art supplies encourages your kids to use their imaginations, while the little desk allows them to work on other projects as well- like work sheets and small crafts. I had a numbers & letters learning mat for Jacob when he was little, it was the best thing ever. It’s a giant puzzle, a protective play area and a way to teach kids the basics all in one. Put it together on their learning center floor and leave it, or use it as a giant puzzle do to together! Kids are never too young to learn about our great, vast universe! Start with something a little closer to home with this fun inflatable solar system! I love it because it’s big and beautiful, and properly proportioned. Kid can see how much bigger Mars is than Earth. Since it hangs from your ceiling, it doesn’t take up real estate on your floor. Want to really get your preschooler engaged in learning? Let them teach YOU! 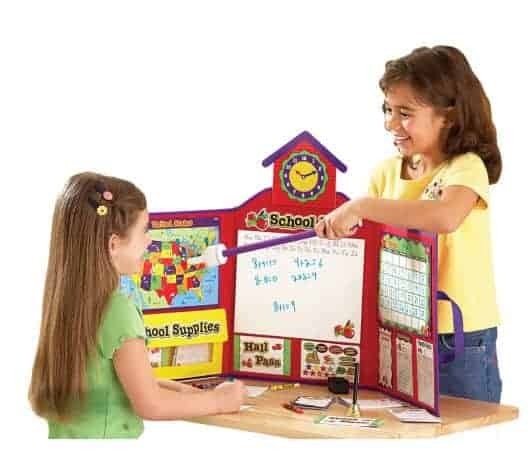 This Pretend & Play School Set comes with everything they need to feel like little teachers. It also helps get them ready for when they start Kindergarten by familiarizing them with concepts like hall passes, hand pointers and the dry erase boards. Add in a few extras, like fun educational board games, crayons and craft supplies, and your preschool learning center is ready! When creating your space, creativity is the key word. Think about how your child can use items for both learning and playing, especially since preschoolers often learn through play. As I mentioned above, all of these items are available on QVC. What makes them so great is that you can use the QCard Easy Pay Every Day option to spread out the cost over 3 easy monthly payments!. All items. All the time. No minimum purchase. No extra charge. Excludes Gift Cards. QCard holders, just select the option at checkout to get what you love and pay over time! I know we’re all feeling the burn of back to school shopping. The QCard gives us all a bit more breathing room. We have a three year old so this perfect! We have a foam mat and a desk, but I could use the other items! My kids have a ton of letter and number puzzles! I really think it did help them learn them faster! These are great ideas! We have a little weather station my kids love to talk about the weather for the day when they get dressed. This is a fantastic idea. I would love to have a magnet board for my kids to play with. I will have to share this with my friends with little ones. These are great ways to incorporate learning with playing. They will be having too much fun to realized that they are learning. I run a daycare and these would fit perfect. Its nice to be able to set it up in your own home. 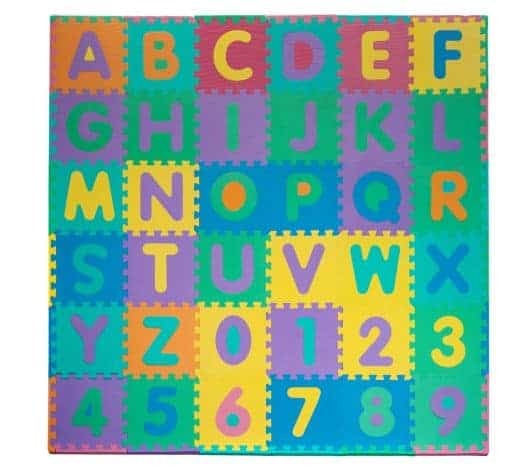 That number puzzle mat would go perfect in my playroom! Such a great idea to create that kind of a space in your own home. I’m loving these ideas. That solar system would be great in a kids room. A lot of really great ideas! I especially like the Inflatable Solar System by Learning Resources. I would have loved that as a child. Cute stuff! It is important for kids to have an area that they feel comfortable using for their projects. These are great ideas! Learning Centers are so helpful when it comes to little ones learning. i love learning centers! they help so much and my kids love them. I think a learning center would make teaching and learning more fun. I love the farm desk and chair. I homeschooled my kiddo when he was in preschool I wish I had some of these when I was teaching him. These are SO cute and I love the idea. I love these ideas. We didn’t have a learning are like this for my son, but I wish we had. We helped him prepare, but I think this would have been so much more fun. My kids have had all these items at one point or another. I think QVC has great items! These are great ideas. I think it’s always important to get the kids started early with learning. The farm desk set is absolutely ADORABLE! 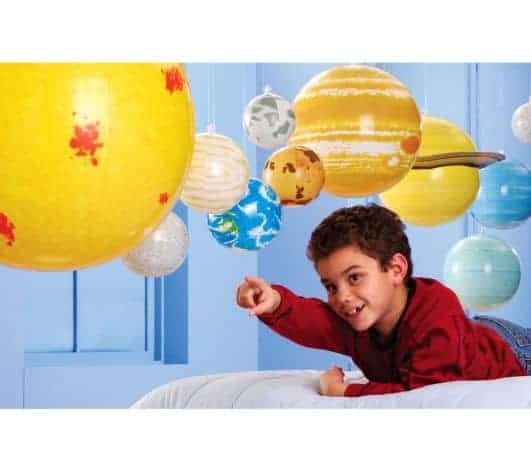 My son would love the inflatable solar system set, too! Looks like there are some amazing products available from QVC. Thank you for sharing! I like everything in the pictures, those are all essential when you want to make your kid practice and learn at home and not just in school. I would’ve given this more effort if I was given a chance to redo this for my twins. This is a great idea. I need to do this with my youngest. He will need space to do homework next fall. Plus, we do some preschool stuff at home too. All of these are so cute. That Barn Desk is just adorable. It would be fun having a little preschool zone in your own house. These are awesome things to include! I love the FarmDesk and Chair! Such a cute design and it would be perfect for preschoolers to get into the routine of “school” days. I have a friend who is wanting to homeschool. These ideas will work great with her little one. I haven’t bought off of QVC in decades! I always though of them for beauty products – didn’t realize they had items like this. Such a wonderful idea to create your one preschool learning center in your home so the kids could learn & play & enjoy the home environment as well. The Farm desk with chair is cute & I love that Inflatable Solar System as well. My brother in law has the floor mat blocks. They’re pretty amazing for the playroom area. Out of all the things shown here, I like the art table the best. I basically gravitate towards kiddie items that encourage art, creativity and the imagination. We are a homeschool family, one of my kids is a preschooler. He has an area to do his work and crafts, I think having their own space is important. What great choices QVC offers! I love the planets! That farmhouse table is too cute! I’m in the process of refurbishing my son’s room into a more school-friendly room, with a new desk, an art caddy with all of his supplies, etc. Cool ideas to foster a child’s love for learning new things. My children had their share of educational toys and I peppered their rooms with knowledge charts too. I guess it worked. They grew up to be smart kids! This is a great idea. I’d love to do this for my youngest. I’ll only have 1 kiddo home this year so I would love to do this for him. Get him ahead a little bit! Oh these are all absolutely adorable. Great ideas for even just helping out your little one with some simple tasks, having this at home will motivate them. These are great ideas! Some of the most important learning is done at home, so you need a good set up. This is such a fantastic idea. I will have to share this with my friends with little ones. That is a great idea. What an awesome way for little ones to learn and play. I had not thought of getting my youngest his own preschool dedk. I know that he still has a lot to learn before kindergarten next year. He enjoys playing tic tac toe already. We played one afternoon after I had him draw a few things. I would like a workbook to use for lessons. I thought my children on their pre school years and I agree with you on all of these! My kids still thank me that I was their first teacher. As a mother who homeschooled this is solid advice that any parent should listen to. Our home is the first place our children learn – if not in the womb anyway. I love the ideas you provided and hope all parents give their kids the best learning environment even if they can’t afford new products so many can be found at the dollar store, second hand, garage sales, or in parenting groups for free. Thank you for spreading good insight!